(Performers: Adele Kruger and Peter Hall; Firehall Arts Centre Production,Vancouver, 2000) Photo by Andrée Lanthier, courtesy of the Firehall Arts Centre. Last semester in my playmaking course at SFU, I had the privilege of being in the room with local playwright Marie Clements as our class took on a devised approach to her play The Unnatural and Accidental Women. The play is based on the true, tragic story of 10 aboriginal women who were murdered by Gilbert Paul Jordan, a barber in the downtown eastside during the 1980s. Marie has written a rich play with vivid imagery and edgy dialogue using an abstract form. It seemed to be a perfect fit for the contemporary arts theatre program with its invitation for a crafted multidisciplinary performance and an opportunity to address the issue of missing and murdered women in the downtown eastside. With the permission of Clements, director Steven Hill decided to present the play as Simon Fraser’s spring main stage production. 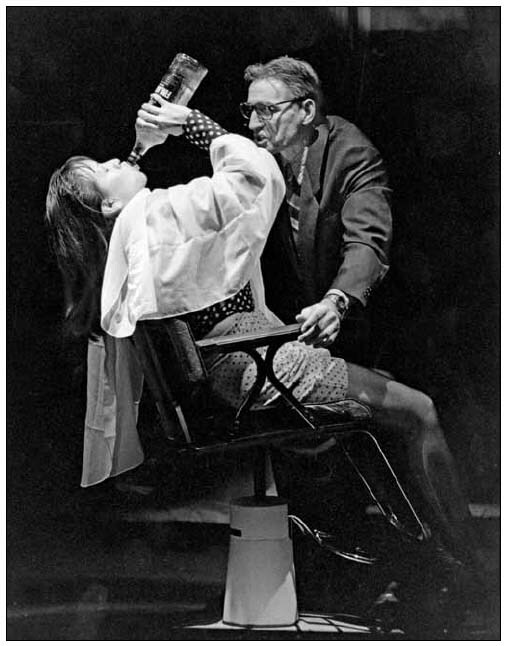 The play originally premiered at the Firehall Arts Centre on November 26, 2000. However, the production did not have quite the same issues that Hill was faced with. How would he address representation of aboriginal women using a largely Caucasian cast of university students? How would it be performed within a colonial construct, taking into account the harmful impacts that colonization has had on the First Nations community? Aware of these concerns, I was curious to see Hill’s approach and how he would make the piece accessible for the downtown eastside community. The Fei and Milton Experimental Theatre was reconfigured from its proscenium set up as a theatre in the round. In the center is a long table set with 13 chairs of various styles and colours. Six microphones, two vintage telephones and nine copies of the play sit on the table. All of the actors enter dressed in pedestrian clothing and one by one they introduce themselves, the character they will be reading, as well as a brief character description. It feels more like a first table read than a performance. At the head of the table sits Renae Morriseau, a native actress, singer, producer and community leader who reads the stage directions and descriptions of each scene. The introduction of the actors, pedestrian neutral clothing as well as the presence of the playbooks in hand on stage is an excellent entry point into representation. It creates a safe space for the audience to engage and empathize because the actors aren’t trying to be something they are obviously not. They are simply people reading a script. The journey of Rebecca, (Sarah Ferguson) a fictional writer searching for her mother in Vancouver’s Downtown Eastside neighbourhood, serves as the play’s ultimate focus. Intertwined in her story we catch glimpses of the women who died, gaining insight about their characters and pieces of their life stories but not much more. As the play progresses scenes begin to take place on platforms surrounding the audience, creating more levels and dimensions. Performers accumulate costume pieces and props, taking ownership of the various roles, including those of theatre technicians. Lights, projections and sound become more prominent and complex with actors holding projectors and light sources illuminating their fellow performers. A sound station is revealed, where the performers manually create sound effects. They crush eggs in their hands, cook sizzling food, pour drinks into glasses, slam bottles, brush teeth, file nails and shower, all of which contribute to a very visceral feeling without being contrived. The work is that of an ensemble. There is a sense of a community that makes the piece come alive. The talented cast of students features Sarah Ferguson, Cathy Falkner, Isabelle Chatelain, Nicola Awang, Valerie Christiansen, Andrew Ferguson, Pascal Reiners, Mischa Shadloo and Caitlin Docking. Supporting roles include Alexa Fraser and Maria Fernandez and Nicholas Masato. Ferguson delights with her charmingly realistic and slightly cynical portrayal of Rebecca. Falkner and Chatelain offer up a fun, comedic relationship in their contrasting roles, and Christiansen and Andrew Ferguson light a fire with their delivery of sharp, snappy dialogue in their disturbing interaction. Guest artist and First Nations leader Renae Morriseau plays an imperative role with her powerful, emotive vocals and drumming. Her voice and presence is fundamental to the action, content, mood and feel of the show made particularly poignant because she is the only aboriginal performer on stage. Steven Hill is known for his aesthetically pleasing sets and brilliant understanding of architectural elements in theatre and doesn’t disappoint. There are mixed media projections on the sides of set pieces and the entire floor of the theatre, with which he manages to create a three dimensional visual space throughout. Every scene has a multitude of activity, from a rack women’s clothing blowing in the wind of a fan, to a large window being washed by an actress with a watering can. Everything is shifting, moving and changing in front and behind the audience at all times which makes for a dynamic and lively atmosphere. Most of the elements in the production coexist together in order to create an engaging experience for the theatre goer. However, Hill seems to falter in his decision to have every stage direction and image read aloud throughout the entire piece. If the choice is an acknowledgement of traditional First Nations storytelling, the reference is unclear. Instead it becomes so description heavy that it consumes the action and flattens the scenes leaving little room for play and imagination between audience and actor. In the end, the success of Hill’s imagery and environmental work is ultimately overshadowed by the difficulties in overcoming the very obstacle he was so aware of in our class. Faced by a group of young, fairly privileged university students, Hill’s decision to protect them with the flatness of almost Brechtian theatre leaves the audience with little emotional connection to a very essential discussion. Instead of feeling the presence of these ten murdered aboriginal women in the room, we get just a glimpse of them, flitting through the shadows.